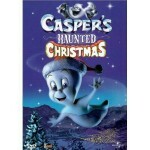 Casper, the Friendly Ghost, resumes his fun adventures with this delightful holiday movie. Casper, normally surrounded by the spookiness of his ghostly world, is seeking the chance to celebrate Christmas. Unfortunately, Casper must increase his scare count to meet his scare quota, and during the holidays too! He is forced to try to scare people, instead of enjoying the warm spirit of Christmas.